Music of a film as big as Bajirao Mastani has to be big, and that too in all aspects. Whether it is the core of it, the spirit it carries or the grandeur that it boasts of, nothing less than massive is expected from Sanjay Leela Bhansali's compositions in Bajirao Mastani. He spins as many as 10 tracks for this mega album that has Siddharth-Garima, A.M. Turaz and Prashant Ingole share credits as lyricists. Right at the beginning of the film's promotion, Sanjay Leela Bhansali and Eros had unveiled Deepika Padukone's 'Deewani Mastani'. It was a smart move as this superb track, with a good Marathi beginning [Lyrics: Ganesh Chandanshive, Singer: Ganesh Chandanshive], managed to strike a chord immediately. Shreya Ghoshal is just the right voice for this beautiful musical piece which has a perfect Qawalli interlude [Lyrics: Nasir Faraaz, Singers: Mujtaba Aziz Naza, Shahdab Faridi, Altmash Faridi, Farhan Sabri] that only adds on to the words put together by Siddharth-Garima. A winning start. On reading Arijit Singh's name, one wonders how the singer would fit into the scheme of things for Bajirao Mastani. However, he shows his classical side well with A.M Turaz written 'Aayat' which has a rather slow beginning, and stays like that right through its four and a half minute playing time. Reminding of the kind of compositions that Bhansali had put together for Guzaarish, this one too remains slow, soft and serene with Qawalli interludes [Lyrics: Nasir Faraaz, Singers: Mujtaba Aziz Naza, Shahdab Faridi, Altamash Faridi, Farhan Sabri. As a matter of fact, this is the better part of the song that otherwise stays ordinary. There is excitement back in the proceedings though with super energetic 'Malhari' which has Prashant Ingole put together some massy lyrics that go truly well with Ranveer Singh's image. The man chosen for the job is just perfect too with Vishal Dadlani showing all over again that why he is the man for the job when the need of the hour is a holds-no-bar-let-your-hair-down number. A celebration number that carries a relentless pace right through its running time of four minute, this is the one that makes you go with the call of 'Once More'. It is back to the classical mode with Siddharth-Garima written 'Mohe Rang Do Laal' which has Shreya Ghoshal starting the proceedings and Pandit Birju Maharaj joining in. Immediately after, the age-old sound of 'Albela Sajan' is back with Bajirao Mastani and Sanjay Leela Bhansali puts together a chorus comprising of Shashi Suman, Kunal Pandit, Prithvi Gandharva, Kanika Joshi, Rashi Raagga and Geetikka Manjrekar for this piece. Both being semi-classical numbers, these are strictly situational and while they have a distinct Bhansali touch to them, one waits to see how they fit into the narrative of Bajirao Mastani. A couple of two new singers are heard next with Payal Dev and Shreyas Puranik pairing up for A.M Turaz written 'Ab Tohe Jane Na Doongi'. What immediately catches your attention is the unique voice of Payal which leaves an instant impression. A romantic number about the female protagonist longing to see her lover stay by her side forever, this one too continues with the trend of situational songs in the soundtrack. While one can well expect some lovelorn moments on display in this four minute piece, by this time one truly waits to hear the next in line that would have a mass appeal as well. The wait is answered with Siddharth-Garima written 'Pinga' coming in next. While a lot has already been said about this being a takeoff on 'Dola Re' [Devdas], the fact remains that this one has its own unique identity and finds a place of its own. Shreya Ghoshal and Vaishali Made come together for this song that has a Maharashtrian folk base to it and goes easy on arrangements and musical instruments. Though one would have liked to see far more elaborate styling around 'Pinga', rest assured it would all look magnificent on screen. Lyricist A.M. Turaz is back in the fold with 'Aaj Ibaadat' which is a Javed Bashir solo. Yes, there are backing vocals of Shahdab Faridi, Altamash Faridi, Shashi Suman and Shreyas Puranik. However, when it comes to taking center-stage, it is Javed who leads the show in this romantic number with a devotional touch to it. This one too follows a situational structure and should go well with the narrative. Ganesh Chandanshive is back in motion which folk lyrics and rendition for 'Fitoori'. He sets the stage before Vaishali Made takes over the scene for this Prashant Ingole written number. With a good pace and rhythm to it, one can well see an enticing number in the making here for Bajirao Mastani. While Aishwarya Bhandari does well as the backup vocalist, this one could well leave a good impression on the basis of the manner in which it is picturised. Last to arrive is Prashant Ingole's take on 'Gajanana' and he doesn't disappoint as he spins together new words once the sound of 'Jaidev Jaidev' is through. For a song belonging to this stage and setting, there is always a tossup between Vishal Dadlani and Sukhwinder Singh. This time around, it is Sukhwinder Singh who comes on the scene and he shows once again how men are differentiated from boys. 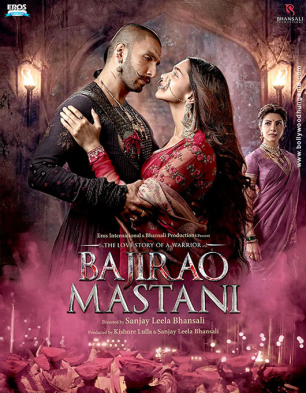 A well-paced high energy track, it concludes the album of Bajirao Mastani on a positive note. Bajirao Mastani soundtrack is on the expected lines. A heavy album with as many as 10 tracks, it is high on classical base with a few potentially popular songs in there as well. Though at least half the songs in there are primarily situational, given Sanjay Leela Bhansali's expertise when it comes to spinning around wonderful visuals, they can be expected to make a good impression on screen.